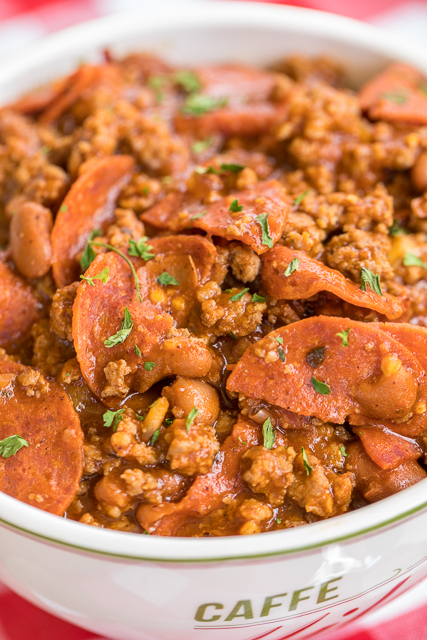 Pizza and chili together in one delicious dish! Ground beef, sausage, pepperoni, garlic, salsa, pizza sauce, chili powder. Ready in about 30 minutes! Can also make in the slow cooker. Great for potlucks and tailgating! Top with mozzarella cheese or some ricotta cheese. Serve with some crusty garlic bread for a quick and easy meal that the whole family will LOVE!!! Freeze leftovers for a quick meal later! 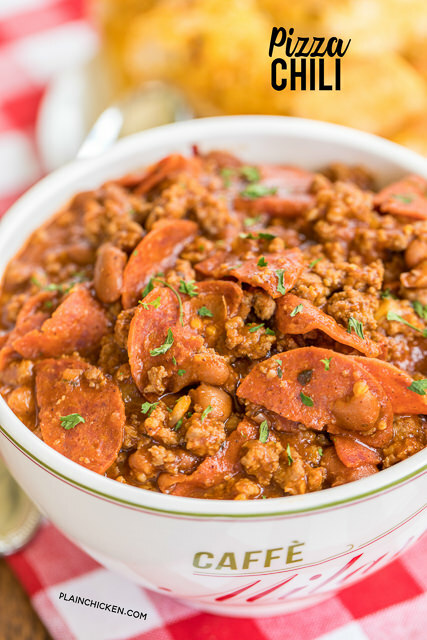 This recipe combines two of my favorite foods - Pizza and Chili!!! 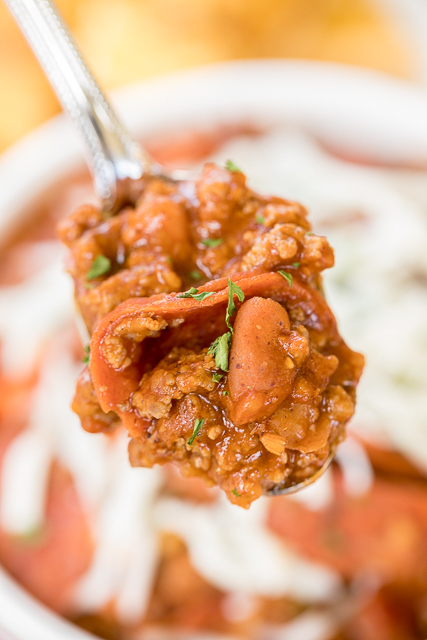 I loved everything about this hearty chili. It has a little bit of everything - ground beef, sausage, pepperoni, chili beans, salsa, pizza sauce and chili powder. I like to top the chili with some mozzarella cheese. You could even add a dollop of ricotta cheese. Bake up some crusty garlic bread and you have a quick and easy weeknight meal that is seriously delicious! I made this in my Dutch oven on the stove, and it was ready to eat in under 30 minutes. You could also throw everything in the slow cooker and let it do its thing. 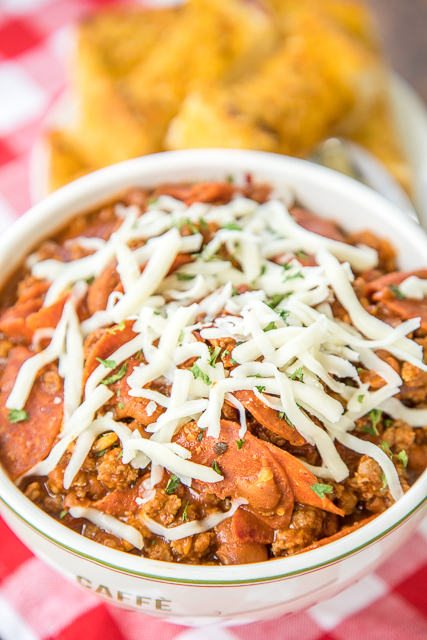 Either way, this Pizza Chili will be a hit! This makes a lot of chili, so it is great for a potluck or watching football with friends. If you have any leftovers, freeze the chili for a quick meal later! In a Dutch oven, cook the beef and sausage over medium heat until no longer pink. Drain. Add garlic and cook for 30 seconds. Stir in onion flakes, salsa, undrained beans, pizza sauce, pepperoni, water, chili powder, salt and pepper. Bring to a boil. Reduce heat and simmer for 20 minutes, until heated through. Great idea Steph - looks awesome.